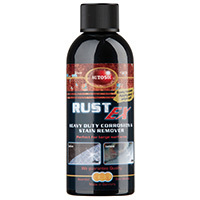 IMS Company - Rust-Ex Rust Remover, 8.4 oz (250 ml) Bottle Not your Average Rust Remover, Rust-Ex is Ideal for Treatment of Large Corroded Surfaces such as Stainless Steel, Carbon Steel, Chrome, Brass, Copper, and More. Provides Protection of Metal Surfaces Against Corrosion Once Cleaned. Contains NO Toxic Ingredients. Rust-Ex Rust Remover, 8.4 oz (250 ml) Bottle Not your Average Rust Remover, Rust-Ex is Ideal for Treatment of Large Corroded Surfaces such as Stainless Steel, Carbon Steel, Chrome, Brass, Copper, and More. Provides Protection of Metal Surfaces Against Corrosion Once Cleaned. Contains NO Toxic Ingredients.